You’ve probably realized by this point that the letters after a trainer’s name can’t tell you everything you need to know. For every C.S.C.S. D* who trains pro athletes and is on the cutting edge of science, there seem to be many more bookworms with the same credentials who don’t know a thing about writing a program for a real live person—and don't have any interest in training themselves. I know this because I’ve been certified as both NASM-CPT and NSCA-C.S.C.S. These exams took a lot of time to prepare for, required me to learn a lot of scientific terminology, and yet I could have passed both by studying a textbook and never setting foot in a gym. Lest you think I’m trying to slam these organizations, both certifications served me well over the years and taught me a great deal. With that said, I didn’t know how much I didn’t know until recently, when I attended a weekend seminar for a relatively new certification, CPPS, which stands for Certified Physical Preparation Specialist. Founded in 2011 by a pair of industry veterans with unimpeachable records, Joe DeFranco and Jim Smith, the CPPS aims to bridge the gap between book smarts and getting real-world results for guys like you and me. “Joe D.” and “Smitty” have a combined 40 years of training experience and have worked with countless pro athletes. Their YouTube channels and DVDs are go-to resources for personal trainers everywhere. They’re both highly successful businessmen and gym owners, but the creation of a new certification wasn’t just a business move. Building a curriculum from scratch was a labor of love, and also a Herculean effort. “Our goal was to add value and give coaches and lifters the confidence in our proven system to help their athletes and clients reach their strength goals safely and effectively,” Smitty says. 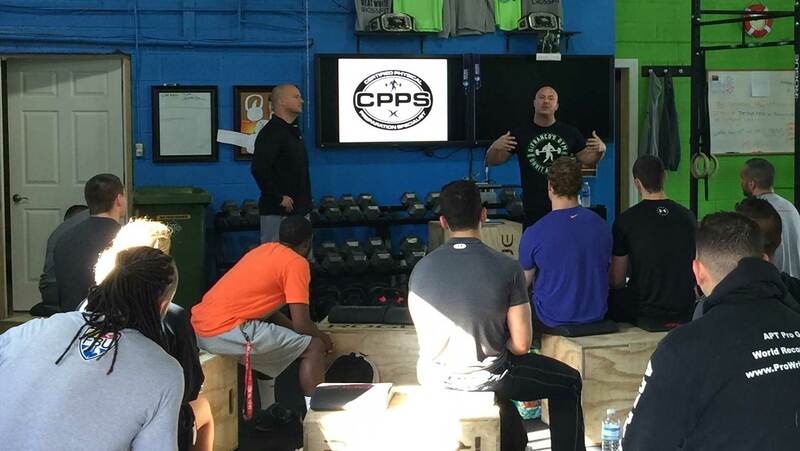 In short, attending a CPPS weekend seminar puts you through somewhat of a grueling two-day crash course in anatomy and physiology, breathing and warmup techniques, squat, bench, and deadlift form, sprinting mechanics, and comprehensive programming methods. Arnold Schwarzenegger, doesn’t have any training certifications and people still want his advice. I know. It’s crazy, right? So I’m not parading my shiny new letters around to say I’m better. What I’m saying is that spending a weekend with Joe D. and Smitty was the most valuable thing I’ve done for my own professional development. Concepts that I knew became ones that I finally understood and could apply appropriately. Specifically, overhauling my bench form is going to help me continue to make safe, long-term gains, and my warmups will never be the same If you ever wanted to get certified, check out the next CPPS seminar. If you’re already certified, it still behooves you to take a look. Wherever you fall on the spectrum, please respect the fact that there’s always more to learn. The only thing I know to be an absolute certainty is that once you think you’ve got it all figured out—in the gym or in life—that tends to be the moment you really start screwing things up.